Most Americans aren’t familiar with Nacogdoches, Texas, and if they are it’s probably because of Clint Dempsey. Nacogdoches is a small town of less than 35,000 people in East Texas, roughly 150 miles from Houston and Dallas. Dempsey, the only American ever to score in three World Cups, grew up playing soccer on dirt fields against Hispanic immigrants in his town. He played in an unaffiliated local Mexican League in his teens, even after he had joined a more traditional Dallas-based soccer program. Dempsey, who takes the torch from the retiring Landon Donovan as the highest-scoring active U.S. men’s national team player, developed his game on the streets. His style is indicative of his upbringing: His innate creativity, finishing ability and capacity to improvise are unrivaled among other American players. “He tries sh*t,” former U.S. men’s national team coach Bruce Arena once famously said. If current national team coach Jurgen Klinsmann gets his way, Dempsey’s street soccer background will no longer be an anomaly. Just after the United States was eliminated from the 2010 World Cup by Ghana, Klinsmann appeared on ESPN to analyze the loss. Though Klinsmann partially attributed the defeat to the team’s inability to refocus after a thrilling victory over Algeria the previous match, he also argued America’s problems on the field stemmed from who was – and was not – playing soccer in the United States. Klinsmann isn’t the first to point out that the technical ability of Americans lags behind a number of other countries. It’s no coincidence that Brazilians, many of whom grew up playing soccer on the concrete of favelas, are regarded as some of the best ball handlers on the planet. 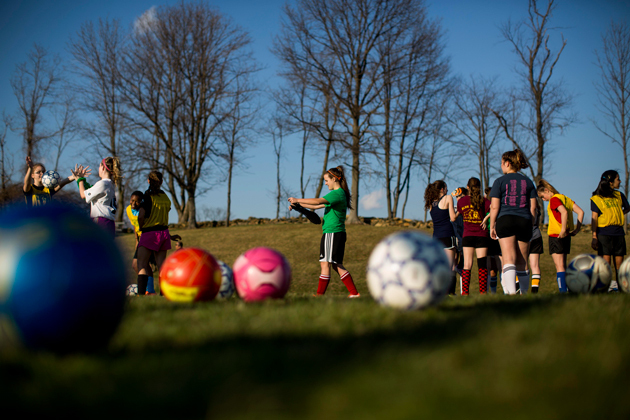 In the U.S., youth soccer often takes place on large, manicured fields in the suburbs. Critics say that kids are overcoached from a young age, leaving them unable to develop creativity in their games. Parents also have to pay for their child to play, usually increasingly so as the player improves and travel expenses swell to hundreds and thousands of dollars. Individuals without financial resources often aren’t discovered because they can’t play travel soccer without a scholarship. Despite the prevalence of organized soccer among American children, millions of others in the U.S. are playing unorganized soccer – street soccer. This type of soccer is everywhere: Small towns like Nacogdoches, inner cities, immigrant communities and beyond. But unlike other sports, in which players from disadvantaged backgrounds have dominated at the highest level – particularly American football and basketball – soccer in the United States has proven to be remarkably inaccessible to many underserved communities. It might sound ambitious, but Andreassen is drawing up a plan to turn it into a reality. Andreassen, the former president of Washington Youth Soccer, assumed the role of chairman on the Diversity Task Force a year and a half ago. It’s a volunteer position, and when he was asked whether he was interested, he recalls asking about the committee’s purpose. He says no one from U.S. Soccer had prescribed the task force any sort of practical goals or function. Since he took over the role, Andreassen has led the task force in developing a concrete strategy for reaching underserved communities in the United States. The idea is that the U.S. is not fulfilling its soccer potential – both at the national team level and below – at least in part because a substantial chunk of the population does not participate in mainstream organized soccer. In theory, if more Americans from underserved communities were provided greater opportunities in the sport, quality of play at all levels would improve significantly. Andreassen’s strategy for identifying and developing street soccer talent is still being finalized, but he has a basic sketch of how the plan will be proposed. The first, essential step is to develop a network of community leaders across the country. These leaders don’t necessarily have to be directly involved in soccer, although that would obviously be a plus. They just need to have intimate knowledge of their communities. A local pastor, for instance, could be a candidate. Andreassen wants to develop a curriculum, similar to U.S. Soccer’s coach licensing program, that would train community leaders and certify them to help U.S. Soccer establish a presence in underserved neighborhoods. These local leaders would be entrusted to help identify soccer talent through local networking, coordinate the creation of community soccer programs, and foster a greater working relationship between U.S. Soccer and locals. Andreassen doesn’t have a timeline for finishing the proposal, and he still needs to work out important details, such as how to fund the creation and implementation of his curriculum. But he said he hopes to present his ideas at a U.S. Soccer Annual General Meeting, perhaps as early as February 2015 in San Francisco, but possibly not until 2016. He also wants to present his plan to U.S. Soccer’s Board of Directors. Though he says he has had extensive conversations with high-ranking U.S. Soccer figures on the subject, he and the all-volunteer Diversity Task Force have been developing the proposal independently. Kathryn Yatrakis, the dean of academic affairs at Columbia University’s Columbia College and an advisor to the college’s Urban Studies Program, serves on the task force. She looks at the issue with her academic background of urban affairs in mind, and she praises Andreassen’s strategy. But both Andreassen and Yatrakis know that the obstacles they face to make a difference on the ground are steep. At first glance, Chesterfield County might seem like an affluent slice of suburbia in the shadow of Richmond, Virginia. The county’s median household income was just more than $70,000 in 2012. It’s a well-off area, though compared to the richest counties in Virginia – such as Loudoun, Fairfax and Arlington, among the richest in America – Chesterfield doesn’t boast exceptional prosperity. But like almost everywhere else in America, Chesterfield County’s wealth isn’t divided equally. David Glass, 52, has lived nearly his entire life in the area. Glass, who coached women’s college basketball for 20 years – including head coaching stints at University of Missouri-Kansas City and VCU – finds himself at one of Chesterfield’s soccer fields almost every night because of his three kids, all of whom play for local clubs. After watching his kids play numerous matches at Chesterfield County fields, which are consistently occupied by organized leagues, he began to notice something peculiar. With concussion reform at forefront, should youth headers be nixed? Glass is the type of person Andreassen has in mind as a liaison to a community. In 2011, Glass and his wife started First Touch Sports, a nonprofit that aims to help kids from low-income families through soccer. As Glass studied Chesterfield’s less affluent community – in particular the county’s Hispanic population – he started noting the numerous barriers in place preventing many disadvantaged children from participating in organized youth soccer. Field access was difficult to obtain, and some fields located close to low-income communities were designated for other sports. These designations may seem antiquated, but they exist all over the country, often making it difficult or impossible for locals to use public spaces for soccer. In one case, Glass’ push to install soccer nets on a field designated for American football was met with stiff resistance from county officials. He was finally able to work with a county supervisor to install the goals. Glass has also pursued an initiative to convert old, unused tennis courts into futsal courts, something being done all over the country, especially in urban areas. When kids try to reserve fields, they can run into trouble. In communities with high immigrant populations, there is also often a lack of trust between immigrants and local government. Even if fields are able to be reserved, the adults who need to sign paperwork are sometimes wary of writing their name on official documents. Another issue in areas like Chesterfield is that there is a disconnect between underserved communities and local youth clubs. Though numerous clubs throughout the country offer scholarships and other forms of aid, American soccer’s pay-to-play model ensures that too many low-income kids are barred from participation. Some travel teams cost thousands of dollars for kids to participate, and even if low-income kids find a way to play for the team, securing transportation to fields often located in suburban areas can be a major challenge. This is especially true if the player’s parents work jobs with inflexible hours, which is often the case in underserved communities. Before J. Marcelo Gangotena moved to the United States and became involved in Virginia’s youth soccer scene, he was a professional soccer player in Ecuador, where he was born and raised. He grew up playing on the concrete patio of a multifamily square house where his family lived. He would play small-sided games, sometimes with as little as two or three others. There were no nets, just a couple rocks to distinguish the goals. Often, Gangotena wouldn’t even have a soccer ball with which to play: He would play with a makeshift ball made of crumpled newspaper, rags and hangwires. If they couldn’t find those materials, they’d play with a grapefruit or empty soda can. ​Gangotena, now a soccer coach and Virginia Youth Soccer Association committee chairman, stresses that his own success as a player stemmed directly from his development on the streets in Ecuador, where he didn’t see a coach until his teens after joining the local club’s academy. In Ecuador, he never paid to play soccer. Gangotena is a sharp critic of America’s pay-to-play soccer model. Andreassen specifically points to Gangotena as the type of individual his strategy needs to succeed. Gangotena organizes soccer “fiestas” in Virginia to bring underserved youth together for love of the game. He praises Chesterfield United, a local club, for its efforts to offer financial aid to skilled, underprivileged youth. But a lack of access to clubs is still a major barrier for the underserved, he says. 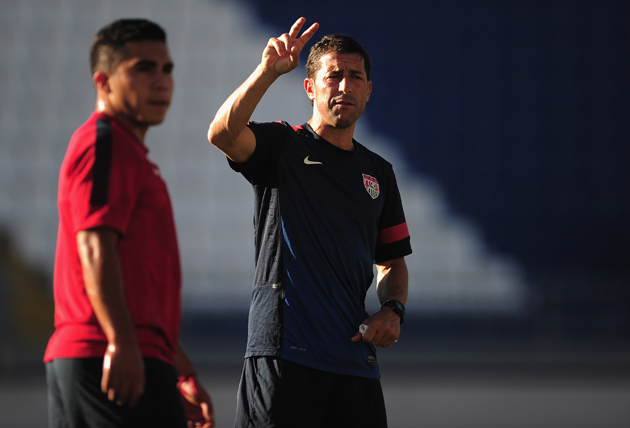 U.S. Under-20 men's national team coach Tab Ramos plays a vital role in cultivating the next generation of American talent. Of course not every underserved area looks like Chesterfield County’s Hispanic population. While soccer is extremely popular among neighborhoods with high immigrant populations of various ethnicities, other underserved communities don’t have the same traditional connection with soccer, such as urban African-American neighborhoods. Growing up in Coatesville, Pa., just outside Philadelphia, J.T. Dorsey was an anomaly: an African-American who liked soccer. Dorsey eventually played professional soccer for a number of clubs, most recently with the Harrisburg City Islanders. But his career almost never got started. As Dorsey started to stand out on the field, soccer became increasingly expensive as fees to play mounted. Dorsey’s mother wasn’t financially able to support him. Luckily, one of his teammates’ parents offered to pay what Dorsey’s mother couldn’t afford. Today, Dorsey – another of Andreassen’s model community leaders – works with largely African-American communities in Pennsylvania as part of the J.T. Dorsey Foundation. Recognizing that his own career almost came to a premature end because of finances, Dorsey is a major proponent of giving kids the opportunity to play without being concerned about money. He also lauds pickup soccer – particularly on poor playing surfaces – as an excellent way to develop creativity and skills without an emphasis on winning and losing. Dorsey and other local organizers stress that it’s important to set up these programs for altruistic reasons. Dorsey’s foundation, like First Touch Sports, focuses on character development and academics in addition to soccer. Dorsey has been remarkably successful in drawing interest in soccer among predominantly African-American communities in urban areas. After seven years, he now has 900 kids in his after-school programs, which are funded by private donations and sponsors, including the U.S. Soccer Foundation. But he still sees many of the same barriers, namely funding and transportation, that Gangotena and Glass see in Chesterfield. It’s important to note that underserved communities cannot be grouped together. The challenges for a community of Eastern European immigrants, for example, are much different than the obstacles for an inner city African-American neighborhood. But Andreassen’s plan is fashioned with this reality in mind: By decentralizing the process of identifying and developing soccer talent, the strategy allows local leaders to adopt individualized strategies rather than shoehorning a national program into communities where it may not fit. Like Gangotena and Glass, Dorsey is just an example of someone who would likely be part of Andreassen’s nationwide network, if his proposal were approved. What will U.S. Soccer gain? Like many who work closely with underserved communities, Andreassen is passionate about developing soccer among disadvantaged kids because he feels it has tremendous benefit to the community and individual children. But like Klinsmann, he also recognizes what the United States stands to gain if it can incorporate players with street soccer backgrounds into its system. As a resident of Washington, Andreassen sees firsthand the on-field benefits of learning the game away from organized soccer. He notes the chemistry between Dempsey and fellow Seattle Sounders forward Obafemi Martins, who grew up playing street soccer in Nigeria. A common criticism of organized youth soccer is that players don’t receive enough experience with the ball because they are too often pigeonholed into positions and overcoached from an early age. Conversely, kids who grow up playing small-sided, unorganized games on poor playing surfaces develop much better ball skills and creativity. Ramos developed his own game on the streets of Montevideo, Uruguay, before immigrating at age 11 to the United States. Ramos’ U-20 team has been praised for its style of play. Paul Gardner of Soccer America noted that Ramos had chosen eight Latino players for his 2013 U-20 World Cup squad. Even though the team didn’t fare well in the tournament, a number of observers commended the team’s approach, which emphasized ball control and flow. Gangotena’s email signature includes a quote attributed to Xavi: “The one who has the ball is master of the game.” It’s an appropriate sentiment considering Gangotena’s views on the differences between players who grow up playing structured versus unstructured soccer. Underserved immigrant communities – from Latin America, Africa, Eastern Europe and elsewhere around the world – often bring soccer experience inherited from generations of family ties to the game, something else Gangotena points out. “They have it in the blood,” he says. Francisco Marcos, the founder of United Soccer Leagues, also believes the U.S. stands to gain from providing more opportunities low-income players, particularly immigrants. Marcos believes American soccer could take a major step forward if MLS academies continue to grow and ultimately take over local youth leagues. Clubs have to do the legwork, he says, to identify and develop underserved youth talent. He advocates creating more spaces to play in urban areas, recalling his own days trying to play soccer on the concrete of Washington Square Park in Manhattan’s Greenwich Village. But he also urges patience: Only eight teams have ever won the World Cup, and great teams like Portugal and the Netherlands have never won. Andreassen understands that cultivating street soccer talent in underserved communities will be a long process. But Ramos says developing these creative players is exactly what the U.S. needs to do to improve. Clint Dempsey’s story serves as a reminder of where to look.